Pay-per-click advertising is provided by search engines such as Google (Google Adwords) and Bing, as well as certain social media and directory sites, such as Facebook and Yelp. Pay-per-click advertising is one of the most effective ways of driving business to a dental practice. Advertisers pay each time someone clicks on their ad. The cost of the click depends on the competitiveness of the keyword used to do the search. For example, a prospective patient does a search for a dentist that will provide dental implants in New York, using the keyword (search term) “dentist Manhattan”. This is a competitive search as many other dental offices are advertising to get the same traffic, but relatively few people are searching for dental implants in Manhattan, and as result the cost of the clicks are above average. Gilleard Dental Marketing has been providing top-of-the-line pay-per-click (PPC) management for dentists since 2007. As our focus is dental marketing, we have been able to develop best practices for pay-per-click that utilize our clients’ budgets optimally to get new patients calling or emailing the practice for an appointment. Our Google Adwords-trained and certified pay-per-click management team use a proprietary many-point checklist each time we work on your campaigns. Get conversion rates as high as 30% for our clients. Get at least 75% of the market share (impression share) in the chosen target geographical area. 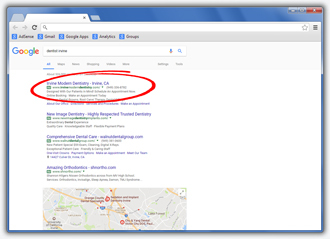 Successfully run PPC campaigns for all types of dental practices in all types of geographic locations in the U.S.; including highly dense urban areas, suburban areas and more rural areas. Select the keywords that will work the best for your practice. Position your ads in their ideal position to get the most clicks at the lowest cost. Significantly cut costs through our proprietary list of negative keywords (keywords that should not trigger ads, e.g. “dental education”). Deploy all types of ads: Search engine, display ads and remarketing advertising. One of our PPC specialists setting up a new advertising account. We use market research to devise your PPC campaigns. As well as research using Google and other search engine tools, we do an online competitive analysis and interview your top patients. Over the years we have interviewed thousands of dental patients and have deep insight into what they are looking for in a dental practice and specific procedures. As a result, we know how to write ad copy that attracts attention and get clicks. Our highly trained PPC managers use specialized software to track which ads and search terms are causing the actual phone calls and emails to the practice. We have obtained many thousands of new patients for our clients. We obtain not only a good volume of patients for our client’s general services, but also for the services they most want to market, such as dental implant treatment, cosmetic dentistry, periodontics, full-mouth reconstructions and many other procedures. 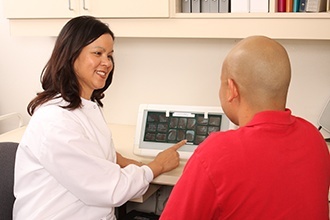 We can also focus exclusively on the client’s specialty or high-end procedures. For instance we successfully market dental implant treatment for our many implant dentists and periodontist clients. The PPC manager studies each client in depth and gains a full understanding of their practice before setting up the PPC campaign. He monitors the account routinely, working with PPC software but also personal analysis. We have found there is no substitute for a trained PPC manager eye watching over the account and adjusting it. Anything you need or any questions you have will be taken care of promptly. 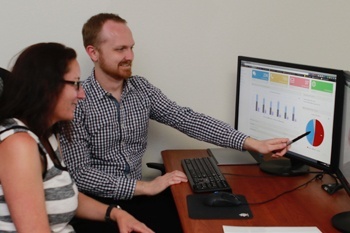 Our PPC specialists reviewing the call tracking and statistics for one of our advertising accounts. Our personal service goes beyond PPC management. We track your calls and listen to every single call from pay-per-click advertising for the first three months to be able to fully optimize your campaign. We can even perform a many-point checklist on your receptionists during this time period so that you can work with your staff to improve their scheduling skills. We send a monthly summary and a detailed new patient call report. Clients also have access to the call tracking. We charge a set-up fee followed by a low monthly fee based on your budget. Your PPC management services are month-to-month, no contract required. New clients get a $100 free Google credit. When you sign up with us for pay-per-click advertising services, we follow an exact procedure to ensure success. Initial interview and questionnaires to gain an understanding of you and your practice, and of your marketing history and marketing goals. For clients with an existing website that will be used for the PPC services, we perform an in-depth website marketing and technical analysis. The marketing analysis will show how well your website markets your practice and the technical analysis will reveal any issues with your website. Pay-Per-Click Account analysis if you have been running PPC ads. A Competitive Analysis for the services you want to market in your area. As needed, we add call-to-actions to your website to encourage potential patients to contact your practice. We design and build effective, organized campaigns using our PPC best practices. We use the most effective and appropriate matching options. Comprehensive keyword (search term) development using our vast knowledge of workable keywords. Development of ad copy and multiple ads per campaigns for testing to achieve the best results. We set ad scheduling and geographical targeting to the maximum number of clicks and highest conversions. If found to be beneficial for your office, your campaign will include Remarketing advertising. We monitor your campaigns very closely from the start. We use a tracking platform that tells us which keywords and search terms result in conversions. Your PPC manager personally reviews your account on a regular basis, adjusting the account for best conversions. We provide scripts and basic receptionist orientation on how to answer the phones for your pay-per-click campaigns. As needed we can also perform a proprietary checklist with your receptionists to improve their scheduling skills. Call tracking, accessible by the doctor. State-of-the-art PPC tracking software that tells which keywords and search terms result in conversions. Phone and email answering scripts. Monthly reports and detailed new patient call report. Adjustment Period. The first three months are our adjustment period. 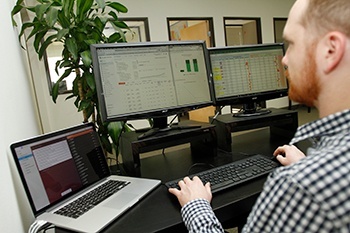 During this time we monitor your campaigns very closely, adjusting them to work optimally. We also listen to every phone call into your practice to count the number of patients actually scheduled as well to monitor for any issues that should be addressed. Our pay-per-click programs start at $547 per month plus pay-per-click (PPC) fees. There is a small set up fee to set your personalized PPC campaigns up and to prepare your website for the PPC campaigns. Our proprietary, optimized PPC campaigns make the best use of your budget. PPC fees depend on the geographical area you are in, what services you want to market and how many new patient calls you want. Budgets start at $600 per month but can be set at the level you want in order to get the flow of new patients you desire. Landing page development. A landing page is a web page that a specific PPC ad leads to. We can create new or replace existing landing pages to market specific procedures. We know how to make landing pages that work for dental practices. If any issues are discovered during our technical analysis, we can provide a quote to get them remedied. Scheduling training. We provide remote and in-office scheduling training. Our highly trained consultants follow an exact program based on best practices in handling phone calls and scheduling. If you’d like a Complimentary Marketing Consultation to see how we can help you, call 855‑486‑2410 or click here to schedule online.